The Child between the ages of 3 and 6 is an active, curious explorer. The ability to take in all information and the thirst to develop new experiences is indefatigable. The child wants to classify and organise the information collected from their own activity. During this period the child experiences enormous development physically, socially and intellectually. The capacity to become a sponge for learning has been observed and described by Dr Montessori as an ‘Absorbent Mind’. Children then are guided to select specific information by periods in their development which allow easier acquisition of knowledge and skills; these well documented periods she called ‘Sensitive Periods’. The 3-6 child has strong Sensitive Periods to language, order, to small detail and to others. Maria Montessori defines this time as the First Plane of Development (0-6). The environment enhances the child’s self construction and the Montessori equipment aids their concentration, self esteem and ordering new acquired information. The learning areas the child has access to are: Practical Life, Sensorial, Language, Mathematics, the Arts, Science, Society and Environment, and any area the child becomes interested in. 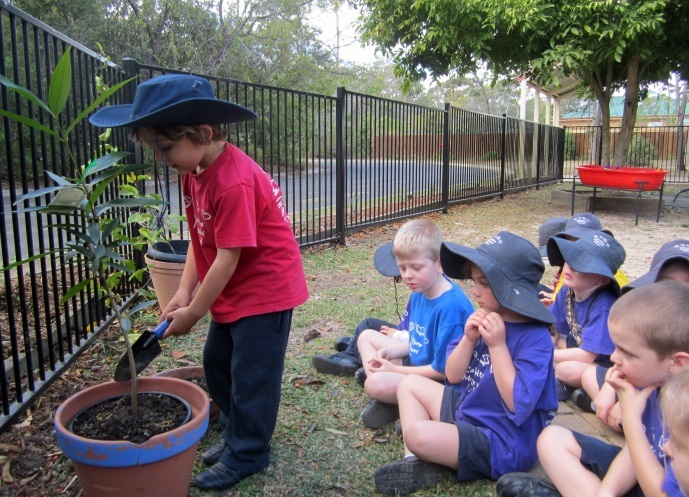 The learning environment includes both indoors and out, and the child will move freely between these areas. The adults ensure that the space where children spend their day is always beautiful and can be considered a home away from home. Children learn through adult direction, in particular through the presentation of materials. Children are encouraged to choose their own work once they have been given the foundations. The adult is a guide and a dynamic link between the child and the environment. The role of the adult is to inspire, guide and give many keys to beautiful doors. It is then up to the child to explore and show the adult the ability, interest and learning style they function best with, so that true learning takes place. The Practical Life activities are familiar cultural activities that the child experiences in their home environment such as polishing, pouring, wiping tables, flower arranging and dressing skills. These activities provide the young child with refinement of movement, order, concentration and precision. Children learn to complete cycles, to choose appropriately and work uninterrupted on a selected task. The materials are didactic, therefore have clear outcomes; some are direct and visible to the child, others are indirect and prepare the child for more complex activities. The areas included in Practical Life are: Movement, Grace and Courtesy, Care of Self and Care of the Environment. Children learn through their senses and the materials provide a tool to extrapolate from concrete, sensorial experiences to abstract understanding. Children play games whereby they grasp concepts such as large and small, thick and thin, long and short. They arrange objects using language such as “taller than, the tallest” or finding “one just a little thicker”. These activities become diagnostic for adults as they show evidence of colour perception, visual discrimination and the child’s sensory functionality. The child also understands the exact language used for specific actions or materials. There is little room for failure as the ‘control of error’ resides within the activity, thus ensuring children succeed, building therefore their self-esteem. Auditory perception is the first stage of any language, so children in a Montessori class are encouraged to talk and to use appropriate vocabulary. The free movement in the class encourages children to form relationships and to use beautiful manners. Activities in the environment provide the basic skills for writing, such as tracking from left to right, with the Practical Life activities; the muscles in the hand and wrist are prepared with the continuous manipulation of materials; the pincer grip is reinforced with many activities in the class, such as puzzles and games. To foster the melodious aspect of language, poetry, songs and rhymes are shared with the children. Language develops naturally and without too many hard rote exercises. Language in a Montessori class is delivered using a phonetic approach and phonemic awareness, and this facilitates reading and spelling. So, from tracing sand paper letters and learning each sound, children will move to composing own words and sentences and learning the difference between a verb and a noun. Non phonetic words are part of fun games children play, promoting memorisation of words that do not follow spelling rules. Once children are able to encode their message through games such as the Movable Alphabet, they soon grasp with ease how to decode words and they begin to read. Mathematics is a language too and children love learning through symbols. Montessori developed an amazing program for children to understand abstract concepts through very concrete step by step mathematical activities. The phenomenal program Dr Montessori designed is admired by many educationalists for its simplicity and efficacy in transmitting the right information to young learners. Each activity is presented as a game and the child will identify symbols and associate these with quantities and then work through the understanding of numbers and decimals. Again, this indirect preparation has started with Practical Life and Sensorial activities. A solid foundation will be laid for operations and beginning lessons in geometry will take place. Music, Art and Drama are evolved through materials and presentations that entice the child to express themselves with other forms of communication besides language. Children are presented the Bells and start by paring and grading notes, progress to learning to read music and eventually even composing their own music. Art and drama are evolved by staff through formal and informal programs and by achieving student outcomes that meet the Montessori curriculum and the National curriculum. Drama takes on a unique aspect with ‘role plays’. Children are taught to become either a protagonist or a member of the audience and learn the descriptors of these roles. The outcome is to understand how to manage a requirement, such as interrupting an adult or asking for help. Other outcomes can be asking children to develop critical thinking and share opinions respectfully and constructively. Visual arts starts with simple activities and then takes on a more formal aspect such as forming secondary colours using primary colours. The components of science are botany, zoology and physics. A Montessori class will have different themes during the year and focus will be given to specific areas to provide a comprehensive program throughout the year. Experiments as well as director (class teacher) made materials will find their home on the shelves in the class. These materials will highlight the concept taught and will have guidelines and control of error within them or close by for students to check their work. Science is loved by many children as this relates to exploration of and familiarisation with the natural world that the child experiences and wants to understand. History is a personal subject for students in the 3-6 environment. It starts with their own timeline of life and the understanding of relevance of time and events. Children work with calendars, timelines and daily known events to establish a sense of time. Learning to recognise time on a clock shows children how we plan our days and far too quickly realise how fast time moves by. Geography in a Montessori cycle 1 class takes on a really interactive aspect with puzzles of countries and continents, land and water three dimensional shapes, flags of countries are studied as well as names of world oceans. All work is done as games, therefore learning is a fun activity. Technology is certainly not forgotten in the 3-6 environment. Children learn about systems and how to function within a system; for instance they learn their role in recycling. Children learn about organic and non-organic materials: how humans have used natural resources to build and construct and how humans have developed materials that are totally synthetic and not found in nature. Children study how technology helps us in the environment and the effects of technology on living and non-living elements. We do avoid the usage of computers with this age group as we feel that sensorial, physical experiences are more supportive to learning than the more abstract two dimensional work on a computer. We are very happy to announce that our Early Learning Centre (Cycle 1) has been assessed against the National Quality Standards and we have been rated as “Exceeding National Quality Standard” in every quality area! This is a great testament to the dedicated staff at our school, and the quality of our Cycle 1 Program. Find out more about Montessori Education, our Cycle 2 & 3 Program and Enrolment.